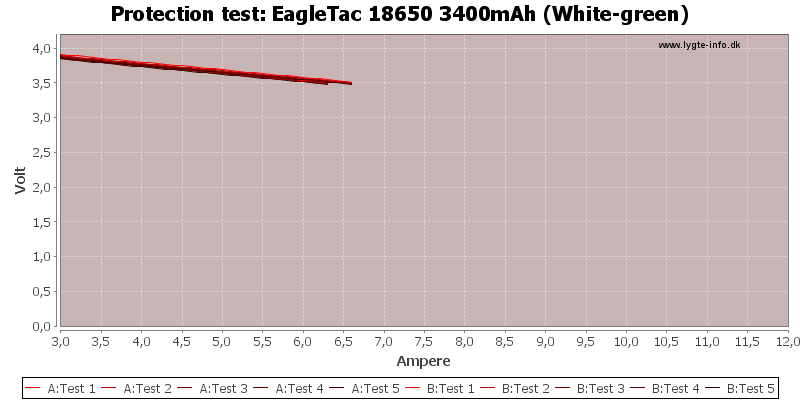 The two batteries does track nicely, due to the protection circuit the battery has slightly lower output voltage at high current. This is a very good battery. 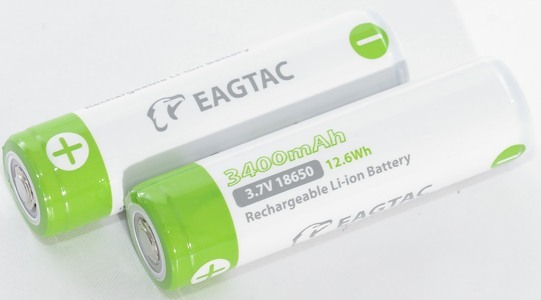 Like the EagleTac 3100 battery, this battery is very short for a protected battery, this can be useful sometimes. Thanks for the review. I do have a question if you can elaborate on. 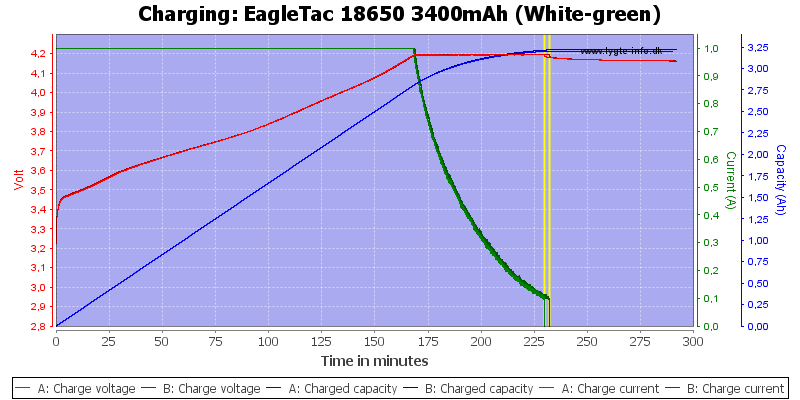 How many less charges will a 3400mah battery give you vs say a 3100mah battery of the exact same brand? Less lifetime of the battery? (Sorry I have no data on that). How often to charge? The 3400 has nearly 10% more capacity, this means that when you charge a 3100 11 times, you only need to charge a 3400 10 times. 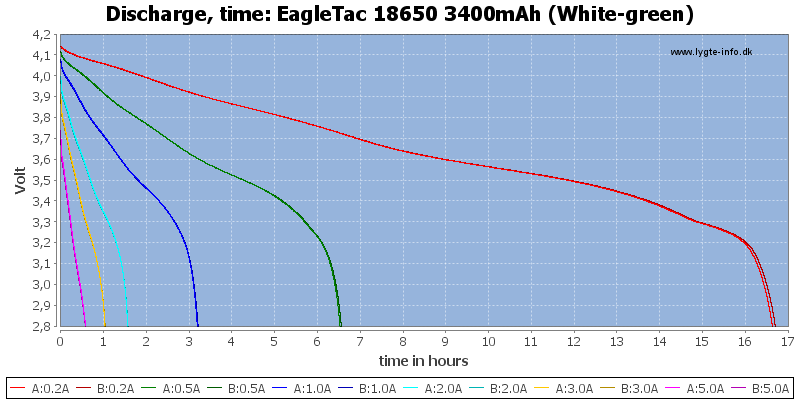 There is usual no reason to replace 3100 mAh batteries with 3400 mAh types, except if you need "5" minutes longer runtime (How much longer depends on the current draw, check the "Discharge, time" curves for actual numbers). 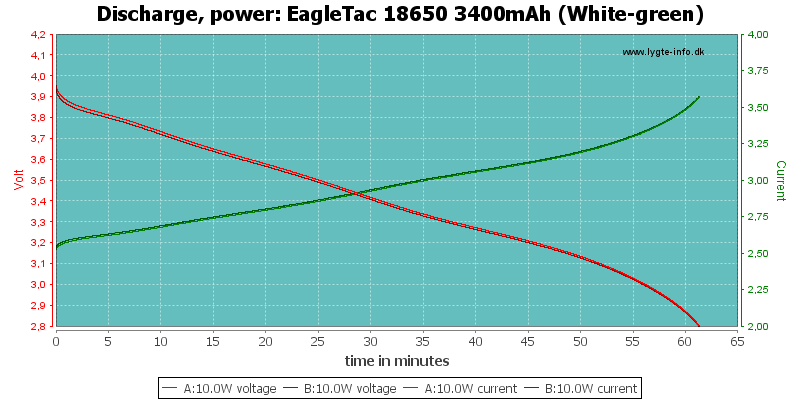 Also remember that LiIon batteries looses capacity with time, i.e. you might be able to use the 3400mAh for longer time, before the capacity is to low for you application. There is only one brand of 3100 and 3400 mAh cells and that is Panasonic, all the different battery brands uses a Panasonic cell inside. I have heard that the higher the capacity of the battery being charged on a charger will actually mean in time it will take less charges down the road. Is that true? Something along the lines that a battery being on the charger longer throughout the life of the battery and that actually diminishes the life of the battery quicker. Now is that fact or fiction? In the datasheets I have seen LiIon are rated for either 300 or 500 charge cycles, I have not noticed if it follows the capacity of the cell (Generally it is very difficult to get the full datasheet). Using a higher charge voltage will increase the capacity of a cell and will reduce the lifetime, the opposite is also true, i.e. 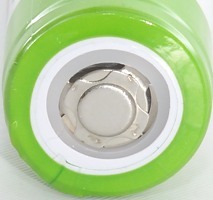 reduce the charge voltage to 4.1 or 4 volt and you get less capacity and considerable longer battery life. Thanks for the review and follow up answers HKJ!! 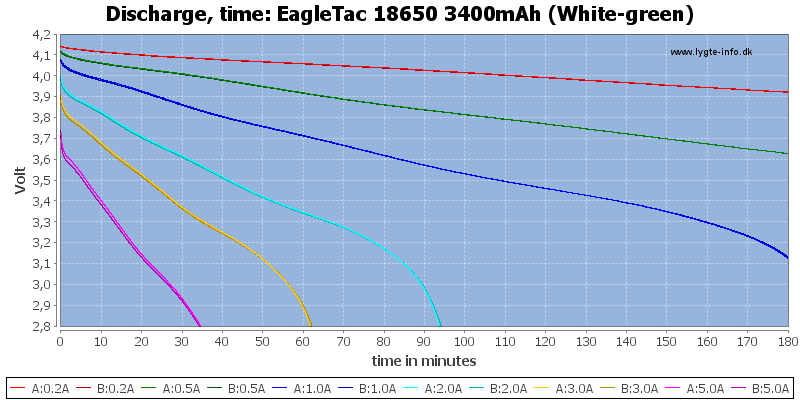 So really in theory a 3100mah battery will more than likely give you more charges and a better overall bang for your buck vs 3400mah battery. I do not believe that, they are probably both rated for the same number of discharges and they do work at the same voltage. 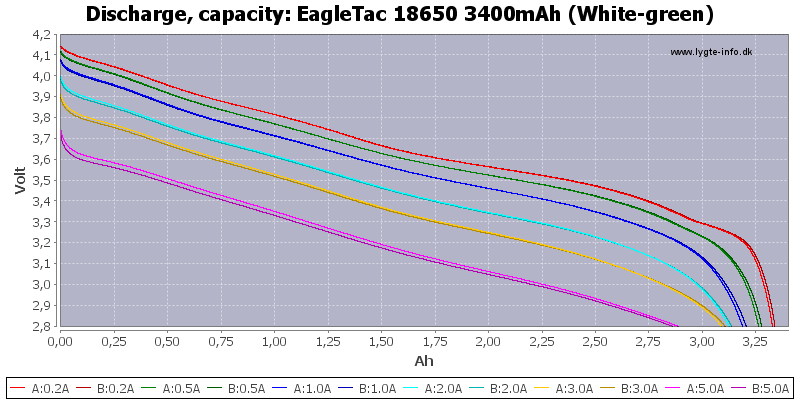 But if you run the 3400 mAh battery with a 4.1 volt charger, it might still be close to 3100mAh capacity (I do not have any numbers), but will have much longer lifetime. Any good places to pick up these 3400 cells, (or any for that matter) that ships to australia? These cells look nice with their white green wrap. Thanks for clearing the air on my question. 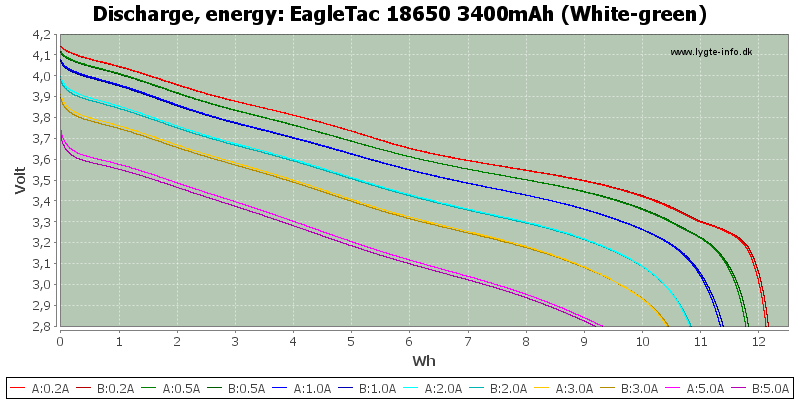 So I may have to start buying some 3400mah batteries. 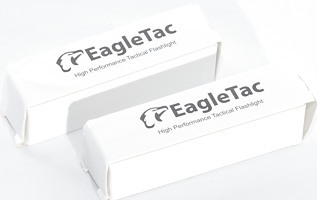 I will say the EagleTac 3100s I have are very well made. They don’t perform any better, or worse really, than any of the other 3100 cells I have, however the short length comparatively, for a button top and the steel plate to protect the PCB do make for a very nice cell. 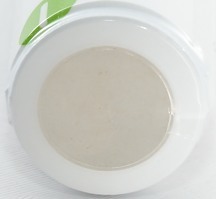 Would I buy more at the price they are, probably not with KumaBear’s Keeppower cells but they are still very high quality. I appreciate the great reviews HKJ as always! Also, have you happened to see any data on how close to max charge vs life to see appreciable life increase of the battery? I have some cheap TR-006 chargers which always charge to 4.17 and always thought that maybe I’m getting a small side benefit of a bit of extended life too. Also, have you happened to see any data on how close to max charge vs life to see appreciable life increase of the battery? I have some cheap TR-006 chargers which always charge to 4.17 and always thought that maybe I'm getting a small side benefit of a bit of extended life too. I do not know how exact and how up to date that info is. Yes tks, I have seen that before, good info. I was hoping for between the max and .1V off of max range, but I guess there isnt any data. I did run across a study showing Li-ion actually does have some memory for shallow discharges recently though, so I’m not sure that site’s seeming recommendation to discharge a battery 50% before recharge to extend life is a great idea anymore. Where is the cheapest place to buy these cells that ships to Australia?